Taipei offers plenty of things to do and some interesting places to visit. Begin your trip by going up to the top of the Taipei 101; at 1,670 feet it’s the third tallest structure in the world. It’s the perfect way to take the city in and appreciate all it has to offer. 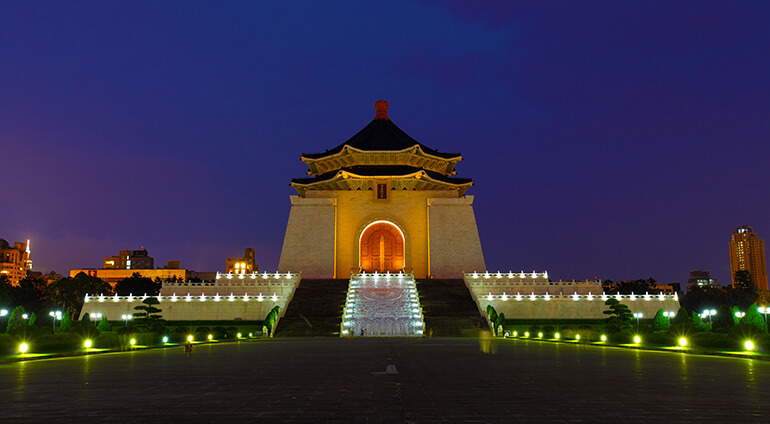 Another landmark worth seeing is the National Chiang Kai-Sek Memorial Hall, which is a traditional Taiwanese national monument. History buffs should head to the National Palace Museum where you can see amazing treasure and Chinese art. Bitan is a popular area for tourists; here you will find pretty parks, cycling paths, hiking trails and a 200m long suspension bridge. This is a lovely place to go walking or cycling and it’s easy to get to via the MRT station. Taipei also has many impressive temples to admire including the Longshan Temple, which was built in 1738 and the Baoan Temple, which is a Taiwanese folk religion temple. If you want to see some wildlife, spend the day at the Taipei zoo where you will come across a wide range of different animals from Asia, Australia and Africa, including wonderful Giant Pandas.